Place of Birth: Cambridge, Massachusetts, U.S.
Matt Damon is an American actor, writer, producer, filmmaker, and philanthropist. 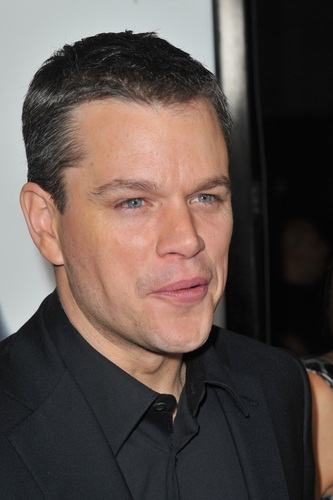 He is known for his roles in the films Saving Private Ryan and The Bourne Identity. Matt is the son of Nancy Carlsson-Paige and Kent Telfer Damon. He is married to Luciana Bozán Barroso, an Argentinian-born former bartender, with whom he has three children. Matt was selected People Magazine’s “Sexiest Man Alive” in 2007. He is thus far the only man of Finnish heritage to have been given this title by the magazine, and also the man with the most Scandinavian ancestry, at roughly one quarter. His father is of approximately one quarter Scottish and three quarters English ancestry, along with distant Welsh roots; many of Matt’s patrilineal lines have been in the United States for many generations, back to Massachusetts in the 1600s. Matt’s mother is of approximately half Finnish and half Swedish descent. On his mother’s side, Matt also has distant Norwegian ancestry. Matt is a tenth cousin, once removed, of his friend, actor and filmmaker Ben Affleck. Matt’s paternal ten times great-grandparents, Elizabeth and William Knowlton, of England, were also Ben’s nine times great-grandparents. It appears that, until 2014, Matt and Ben were not aware of this genealogical relationship (common for two people of New England, English, ancestry). Matt’s patrilineal line can be traced back to Thomas Damon, who was born, c. 1627, in Faversham, Kent, England. Matt’s paternal grandfather was Albert Howe Damon, Jr. (the son of Albert Howe Damon and Grace Henrietta Telfer). Matt’s grandfather Albert was born in New York. Matt’s great-grandfather Albert was the son of The Rev. Albert Nelson Damon and Hattie Salisbury. Grace was the daughter of Andrew Taylor Telfer and Anna Marie Turnbull, who were born in Scotland, with Andrew being from Jedburgh, Roxburgh. Matt’s paternal grandmother was Roberta May Fay (the daughter of Clarence Farwell Fay and Maybelle Eleanor Kent). Roberta was born in New Jersey. Clarence was the son of Adoniram Judson Fay and Altemirah A. Smith. Maybelle was the daughter of Charles Alvin Kent and Evelyn M. Hammond. Matt’s maternal grandfather was John Walter Paige (originally Nils Johan Pajari; the son of John Pajari, originally Nils Johan Olafsson Pajari, and of Impi Neimenen/Nieminen). Matt’s grandfather John was born in Minnesota, to parents who were both Finnish immigrants; John’s surname was changed from Pajari to Page. Matt’s great-grandfather John was the son of Olli/Olaf Johansson Pajari/Bajar and Kaisa-Greta Kreeta Vanhakartano. Matt’s maternal grandmother was Margaret Johnson (the daughter of Carl Emil Johnson and Cecelia/Cecilia/Celia A. Carlson). Margaret was born in Minnesota. Carl’s parents, August Johnson and Ida, were Swedish. Cecelia was the daughter of Charles F. Carlsson, who was Swedish, and of Catherine, who was born in Finland, and was likely of Swedish descent. Matt’s maternal grandmother was only of Swedish descent. This census has Catherine’s birth place as “Fin.-Swedish”. Matt’s patrilineal line can be traced back to Thomas Damon Sr., born c. 1627, in Faversham, Kent, England.